contact Tony Lay or contact Al Williamson. *The last 10 rounds of this match will be shot at 200 yards. Following the Saturday August 10th, 2019 Match, we will all move over to the DBCL clubhouse for the VMRM Banquet. First relay begins at 8:00 a.m. after Range Safety "Course of Fire" announcement. All matches are scheduled to run from 8:00 a.m. until 1:00 p.m.
Will be posted here after the event. The match will be bench rest 50 rounds at 100 yards using the NRA SR21 and SR21C targets. Each string of 10 rounds will be fired in 5 minutes with 5 minutes in-between strings for scoring, and putting up new centers. Three sighters will be allowed before the first string of 10 with the lowest three hits on the target being dropped. For the final bolt-action match of the year the last string of 10 shots will be fired at 200 yards using the NRA MR-52 target. Spotting scopes are permitted. Ammo can be commercially purchased or handloads. Eye and Ear protection are required. Open bolt indicators must be used, and will be available at the range. As always, the decisions of the ranger officers are final. If you wish to shoot in more than one relay for score, you must shoot the additional relay with a different rifle. Again for 2019 Rule for August 10th Bolt-Action Plus match. We are going to give everyone 15 minutes to complete the 4th and 5th strings of the relay. The extra 5 minutes will be considered a second prep period where you will be able to shoot 3 sighters at the 200 yard target. When scoring you should have 13 hits on your target. You will drop the three lowest hits. There are four separate classes for the matches. People in these classes will be competing only against the others in their class. Winners of each match will be awarded a VMRM certificate if requested. As Issued Class: Rifles must be bolt action, issued by any country to its military forces. The rifle must be as issued with no modifications of any kind. Faithful reproductions will also be allowed in this class. As Issued Scoped Class: Rifles must be bolt action, issued by any country to its military forces. The rifle must be as issued with no modifications of any kind including original scope. Faithful reproductions will also be allowed in this class. Open Class: Rifles must be bolt action, issued by any country to its military forces. The only thing that needs to be original is the receiver. All other modifications are allowed. 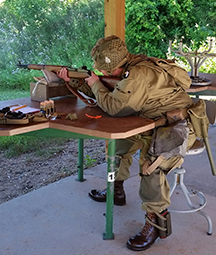 Open Scoped Class: Rifles must be bolt action, issued by any country to its military forces. The only thing that needs to be original is the receiver. All other modifications are allowed. The match will be bench rest 50 rounds at 100 yards using the NRA SR21 and SR21C targets. The first strings of 10 rounds will be fired in 5 minutes. The second string of 10 rounds will be fired in 4 minutes. The third string of 10 rounds will be fired in 3 minutes. The fourth and fifth strings of 10 rounds will be fired in 2 minutes. There will be 5 minutes between strings for scoring, and putting up new centers. Three sighters will be allowed before the first string of 10 with the lowest three hits on the target being dropped. Spotting scopes are permitted. Ammo can be commercially purchased or handloads. Eye and Ear protection are required. Open bolt indicators must be used and will be available at the range. As always, the decisions of the ranger officers are final. If you wish to shoot in more than one relay for score, you must shoot the additional relay with a different rifle. M1 Garand users please note that we will have a quantity of two round en-block clips for you to use during the match. Winners of each match will be awarded a VMRM certificate upon request. As Issued Class: The rifles must be Semi-Auto issued by any country to its military forces on or before 1956. The rifle must be as issued with no modifications of any kind. Faithful reproductions will also be allowed in this class. As Issued Scoped Class: The rifles must be Semi-Auto issued by any country to its military forces on or before 1956. The rifle must be as issued with no modifications of any kind including original scope. Faithful reproductions will also be allowed in this class. Open Class: Rifles must be Semi-Auto, issued by any country to its military forces on or before 1956. The only thing that needs to be original is the receiver. All other modifications are allowed. Open Scoped Class: Rifles must be Semi-Auto, issued by any country to its military forces on or before 1956. The only thing that needs to be original is the receiver. All other modifications are allowed. The 1956 date was chosen to prevent M14/M1A1 and AR-15/M16 rifles from being used in this match. A survey of shooters indicated to us that people did not want these rifles to be legal for this competition. If you have a question about your rifle please feel free to contact us at the numbers listed below. Match fee will be $5.00 and we supply the targets. The matches are open to the public. Matches will be held rain or shine. We are constrained by time so a limited number of relays will be run. Reminder: 15 hours worked in a year reduces your annual membership fee. Each Friday before a scheduled match and the day of the match, work hours can be earned at the 100/200yd range. Friday: 4:00 PM through 6:00 PM. Saturday: 6:30 AM through 1:00 PM. Please contact Tony Lay or contact Al Williamson with any questions.